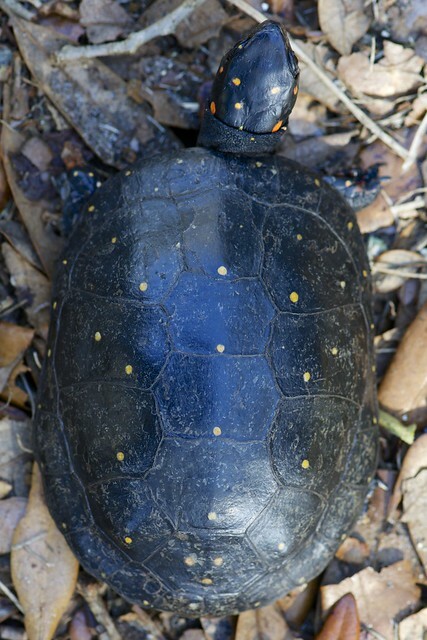 Arguably Florida's most attractive and elusive herp the spotted turtle (Clemmys guttata) is a creature of special interest to us here at Wetland Preserve. In early Spring 2015 a male we found crossing a road lead to many hours of learning and fun. As we had knowledge that there was interest on the part of Florida Fish & Wildlife Commission biologists in documenting them an email was sent announcing that we had him. We let them know that we'd not let it go until they'd had a chance to do their "biologist thing". The results of that communication was the prompt arrival early on the ensuing Sunday morning of Paul Moler, internationally recognized herpetologist and Jonathan Mays, FWC biologist with spotted turtle experience form other states to do the documentation ( DNA also ). During the discussion we mentioned that we had seen and actually had pictures of 2 other spotted turtles on the property. Needless to say they were interested. And that interest manifested itself in the form of a trapping/documentation effort on Wetland. Now let us say, there is little in life more fun that following along in the woods behind a biologist who LOVES his work........because he will educate as he goes. For example: who knew we had members of the tarantula family in our woods or that there were not one or two species of crawfish in Florida but 7 or more. You learn these things following Jonathan Mays about in the woods. You also learn about amphiumas, logger head musk turtles, fliers and more. Plus you get to catch some of the finest water moccasins you ever saw! The FWC was assisted by biologists Dirk Stevenson and his volunteers from the Orianne Society. The Orianne folks were as passionate as Jonathan & Paul and added immeasurably to the effort, and the fun. Our contributions to the effort included the procurement of crab & eel traps, a number of which were donated to the FWC & to the Orianne Society, and more than a little grunt labor as we set a fair number of our own traps. In fact, 2 of the nine spotted turtles ( plus the initial one ) were caught by us. We could go on and on.....suffice to say though that it was enriching. The links below are informative very informative. The Flicker link will carousal some of Jonathan's captures and the Orainne Society website is worth a hard look. As for the results: If we have our information right, a total of 9, counting the one that set the whole expedition rolling along were documented. The significance, again IF I have my information right, is that the FWC has been able to establish a much better picture of distribution and prevalence for the spotted turtle in the Rice Creek watershed, a watershed with almost no documentation previously. Louann with one of the spotted turtles we caught on our own.......yes......hard to see.